Tiramisù is a heavenly dessert I was glad it was this month's challenge. And every component was to made from scratch - that is the savoiardi biscuits, mascarpone cheese, zabaglione and the pastry cream - then these were assembled with whipped cream and a flavoured liquor to make the final tiramisù. Tiramisù is already a plural in Italian so it is three tiramisù not three tiramisùs. 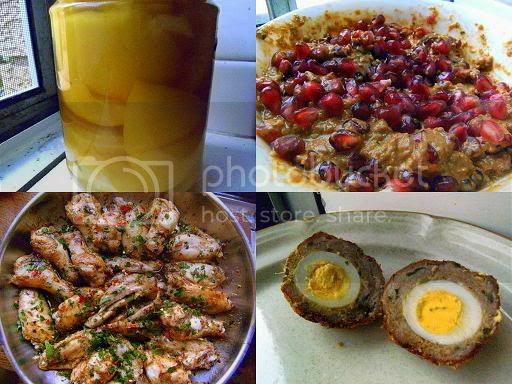 Overall the challenge recipes are very simple and give great results. Thank you Deeba and Aparna for an excellent challenge. The Savoiardi Biscuits recipe is a minor miracle the end results are wonderful and so so good, the biscuits have a crisp crust and a lovely texture inside. The only slight change I did was to beat the egg yolks until they formed a thick stable foam which makes it so much easier to fold them into the egg whites without loss of volume and even adds some more volume I think. The final biscuits were lightly browned on the bottom but had a crisp firm crust and a lovely cakey inside that was delightfully. And they are so much better than the store brought ones and so easy and quick to make. 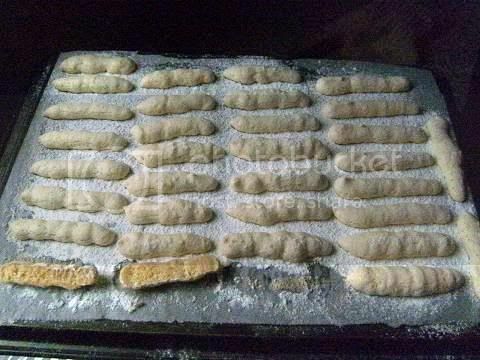 The small ones took the 15 mins but the larger ones I left in the cooling oven which baked them to the right degree. They certainly do taste of eggs but I like that. I made a quarter batch of the reveal recipe for testing the baking methods and making the tiramisù methods. 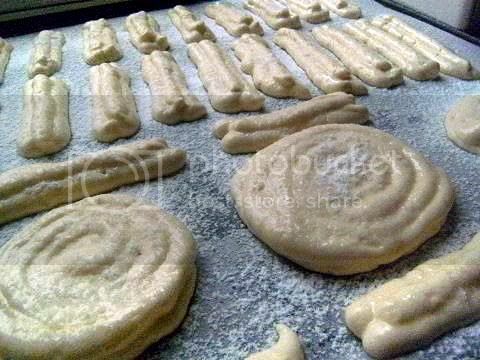 I added 1 teaspoon each of cardamom and sumac and 2 tablespoons walnut meal to the cream filling, also I used mint coffee with gin to soak the savolardi biscuits, then I added cocoa powder with 1/4 teaspoon of home-made hot harissa powder on top. Yum Yum this is perfect. And the Moroccan spices add that nice touch of exoticness that is needed. 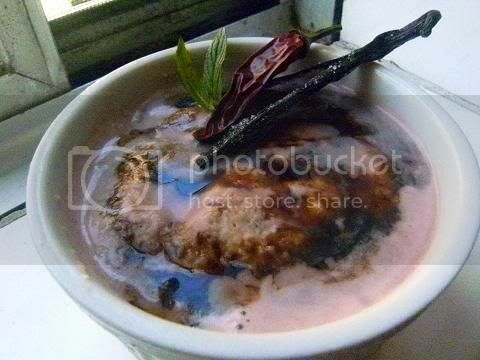 The mint gives a cool fresh flavour and the cocoa with harissa powder gives a hot deep flavour. I feel this contrast is necessary for such a rich dessert. The savolardi biscuits are not soggy at all I only soaked one side which helps keep their shape. It's very hard to get good photos of this treat. This was so good great flavours. Sorry I forgot to take a photo of the blood orange sauce it is too dark now will do it tomorrow. Powdered harissa my recipe - dried red chillies, powdered saffrron, coriander, mint, cumin, caraway, orange peel and garlic. 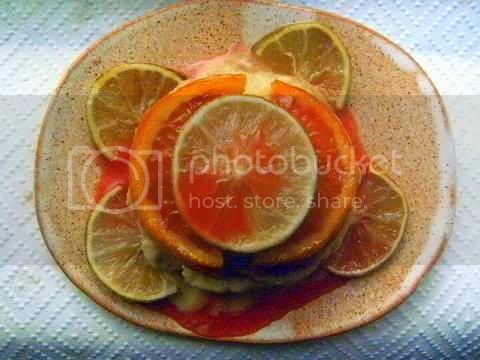 Blood orange sauce - juice of 2 blood oranges with 2 tablespoons of sugar simmer reduce to 1/4, add 1/2 teaspoon of balsamic vingear adjust seasoning to have a balance of sweet and sour. Mascarpone – this is simple but it really does take 15 mins of gentle heating and stirring to get to 190F I used a candy thermometer. Adding the lime juice just thickens the cream slightly and draining overnight in the fridge firms it up to the correct consistency. 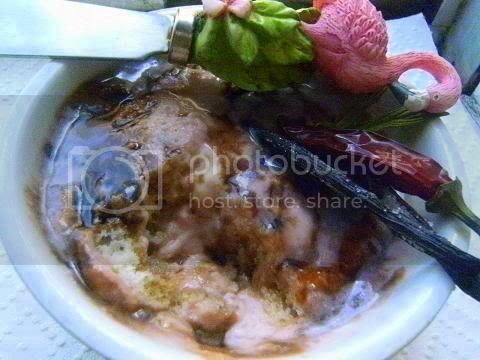 Zabaglione – this is so delicious I could just eat this and not worry about the rest of the challenge. 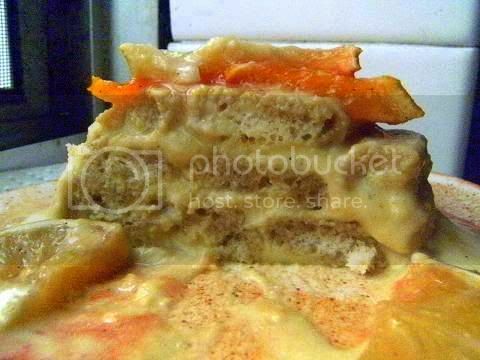 Again gentle heating and constant stirring gives you a wondrously thick yet light custard great recipe. 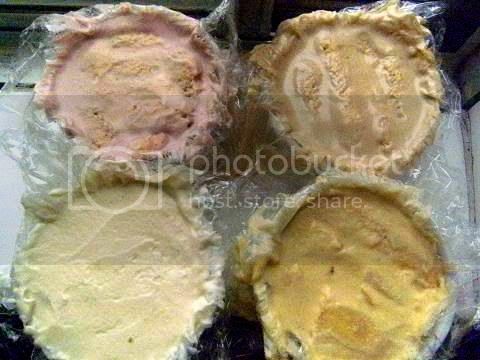 Pastry cream – not as tasty or as rich as the zabaglione also it takes longer but it is very light and full of bubbles which remain when left overnight. 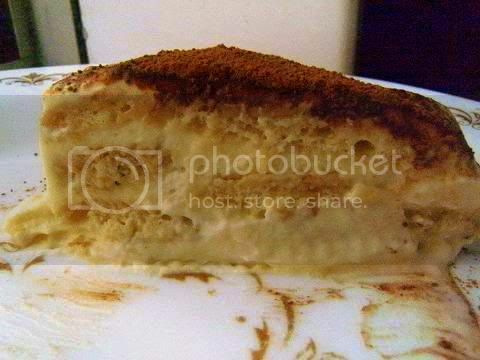 Making the tiramisu – it is much better to have an even layer of savoiardis without holes which helps the completed tiramisù maintain a better shape. The filling sets only to 'soft firm' which is what you want but makes it almost impossible to cut cleanly. 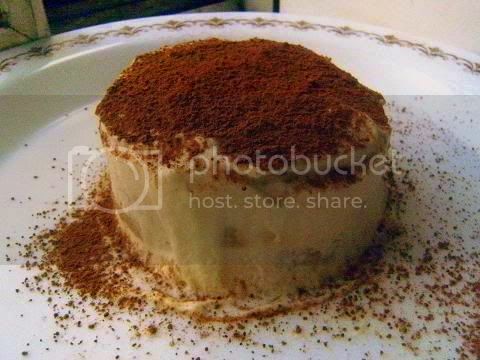 I thought I would some very refreshing tiramisù since it is a pick-me-up! Persian date tiramisù – Cardamom/cumin/vegemite coffee infused dates, soak the biscuits in coconut cream with powdered chilli, flavour the cream with saffron and mint. 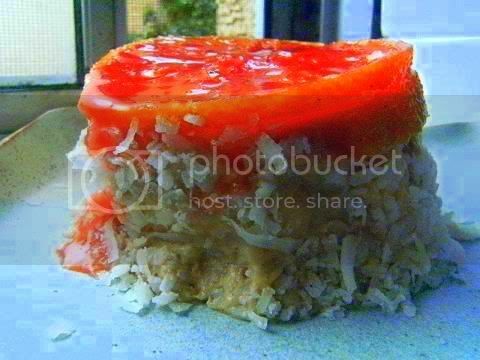 Top with moist coconut flakes. 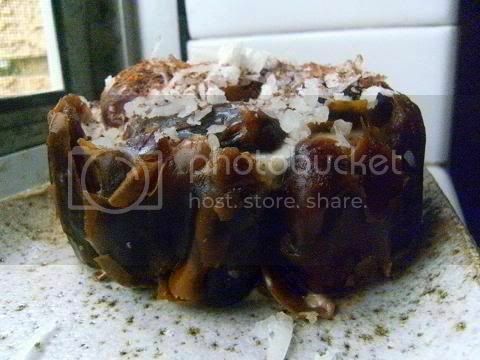 The dates are so soft and add a lovely look to the tiramisù, and the overnight soaking of the dates in the salty spicy coffee really adds a great contrast to the sweet filling. Italian lemon tiramisù – Preserved lemon and candied citrus, finely cut up ½ preserved lemon (you need a lot to contrast with the sweet filling) add to the cream filling, soak the biscuit in lemon liquor. The salty preserved lemons adds a lovely zing to this tiramisù. 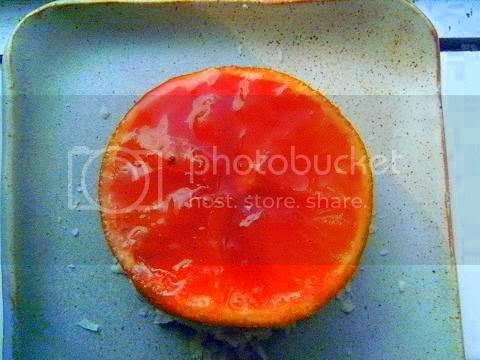 Serve with blood orange sauce you can see the sauce near the bottom of the photo yum yum. Arabian Evening tiramisù – Soured cherry preserves in the filling and and the pomegranate sauce on top has chilli, mint and vanilla bean. Soak the biscuits in hot honey with some rose water. Heavenly for people in love. 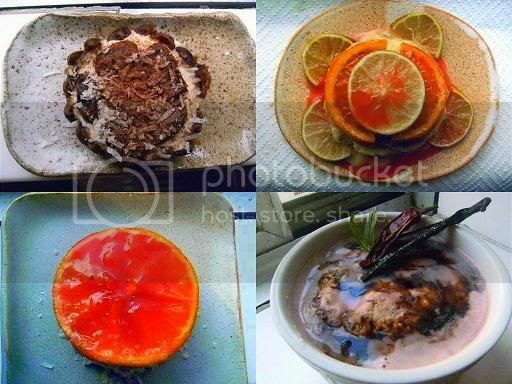 Eye-popping Egyptian Jaffa (Orange and bitter chocolate) tiramisù- make neon-orange jelly (jello) and use orange rinds without the fruit to make the jelly oranges for the topping. Bitter chocolate flavoured cream (the more bitter the chocolate the better) with orange liquor soaked biscuits. 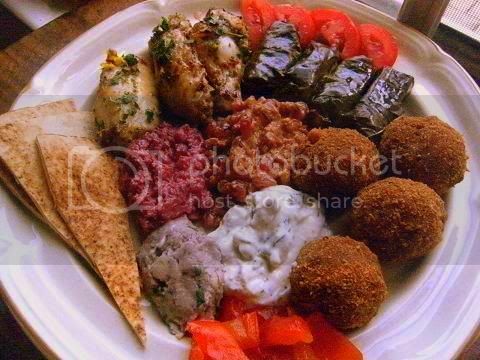 This month's challenge was to prepare a Mezze platter with two mandatory items – pita bread and hummus. 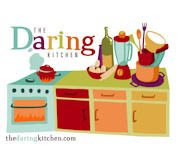 This is the type of challenge I like – lots of creativity allowed with a couple of delicious standard recipes. 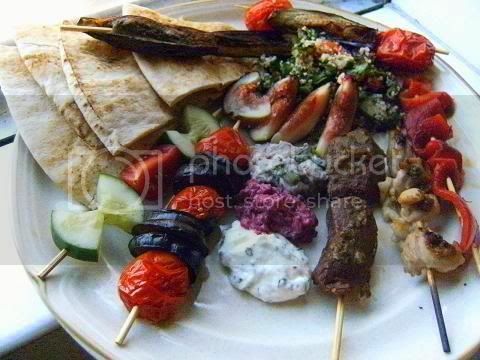 Here is a link to a TALKING web site you can hear how English (USA and UK) speakers say the word mezze. Just click on the word on the left-hand side list. The website pronounces it as 'mez-zay' but that doesn't mean it isn't 'mez' in the original language the word came from! 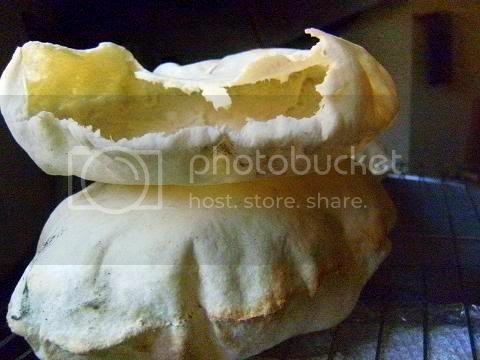 Pita or pocket bread is easy to make and forms a wonderful puffy pocket which can be filled with any sort of wonderful titbit you have on hand. Hummus is a chickpea dip that is ubiquitous in Middle Eastern mezzes. 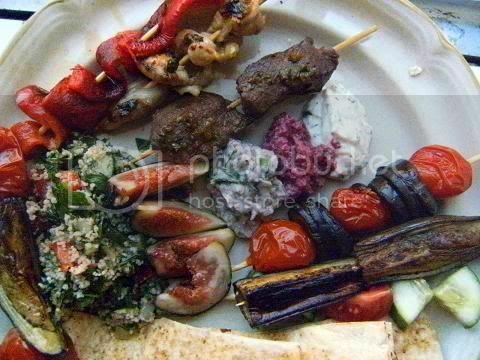 The recipes that Michele chose were simple and simply scrumptious, she also provided a whole raft of other mezze recipes that could be added if you wish. See here for the recipes.See here for a PDF of the challenge. I can get my oven to over 315C/600F I preheated for 50 mins at the higgest setting and didn't use a water pan as I usually do and they baked in less than 1 min. I didn't squash them flat when they were still hot so they stayed in that shape when cooled but were very soft on the inside. 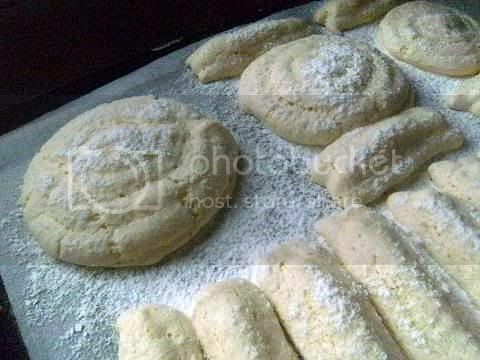 The steam created in the bread was amazing I had to use very long tongs to take the pita bread off the baking stone. The steam escaped from the bread for about 2 mins after I took them out of the oven you could hear it singing from the small holes created in the crust. 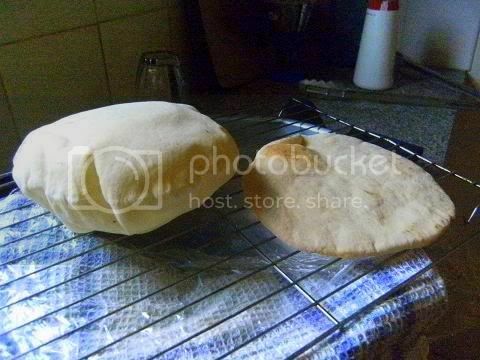 It was so strange looking at the flat unbaked dough became a huge light ballon of baked bread. I have 16 pita balloons now waiting to been eaten LOL LOL. They are the size of footballs hehehe. 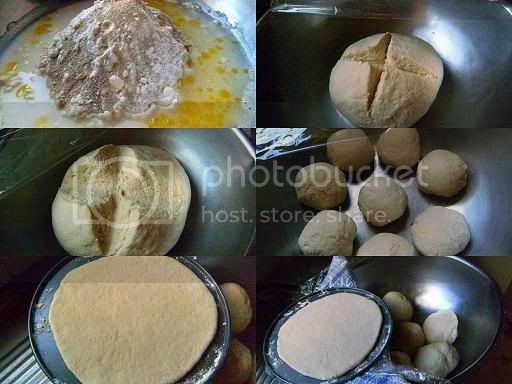 The dough resists rolling out and wants to shrink back just keep at it and it will roll out. 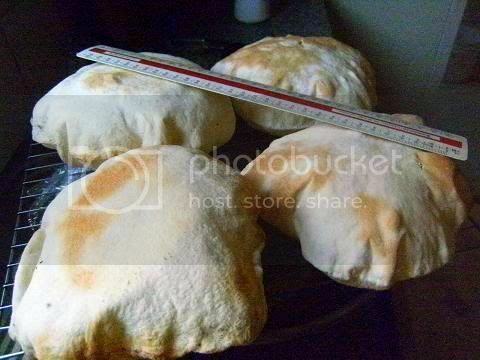 The reveal recipe is very good, I think I will make pita bread using it from now on and I did stir 100 times!!!! Also I accidently did two provings instead of the one in the recipe, I make a lot of bread and always prove twice and the habit is hard to break. I think when I do these again I've have to bake them for only 30 secs instead of the 1 min I did for these ballons. Ingredients - I used butter beans (I couldn't find any chickpeas in cans at the local shops! I have some dried beans soaking at the moment) and peanut butter with ½ teaspoon of sesame oil to kill the taste of the peanut butter I added the lemon juice then I added extra sumac, a lot of mint, chillies, garlic chives (I do not like the taste of raw garlic so I use chives which adds a mild garlic flavour and onion flavour to the dip at the same time), a little salt and some olive oil to enrich the hummus. The addition of sesame oil really makes the final dip taste exactly like normal hummus. I didn't like the taste of the peanut butter in the dip. Also I'm surprised that sumac wasn't mentioned it is one of the most important spices in making mezze dishes. It tastes a little like lemon. I only used 1/2 tablespoon of lemon juice I think the reveal recipe has much too much lemon juice. 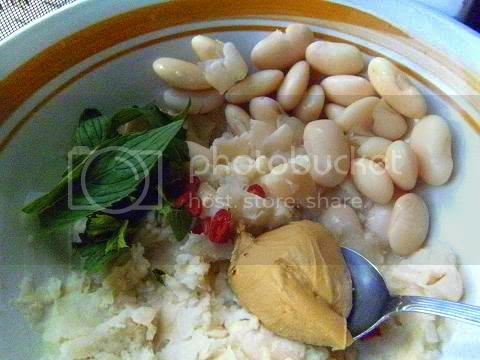 It tasted wonderful the butter beans really added a depth of flavour to the final dish and a superior texture than if I had used chickpeas, while the sesame oil really helped it taste like I used tahini instead of peanut butter. And importantly peanut butter and sesame oil are so much cheaper than tahini which is very expensive in Australia and I couldn't find it anyway! So these substitutions might be worth thinking about if you cannot get these ingredients or don't like chickpeas/peanut butter/raw garlic etc. Also I hate buying an expensive ingredient (in this case tahini) and only use a small amount of it and then I find that I have to throw it out a year later since I haven't use any of it after the challenge. I use peanut butter and sesame oil all the time. 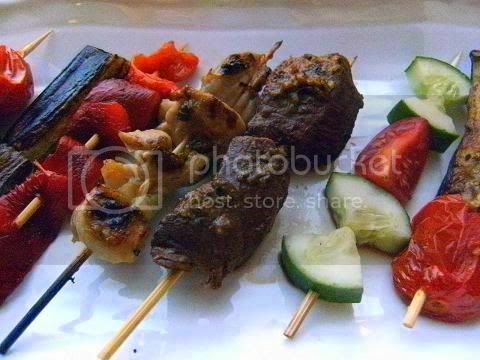 I decided to do a number of skewers since it would be much easier to place the ingredients into the pita bread. 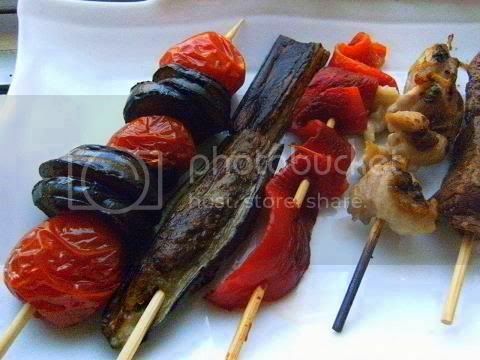 I had the following skewers (see below) - roasted cherry tomatoes with sliced baked black olives; roasted egg plant; roasted capsicums (bell peppers); marinated (Middle Eastern herbs and spices) chicken; sumac kangaroo; raw tomato and cucumber; roasted tomatoes & egg plant; and lastly fresh figs. 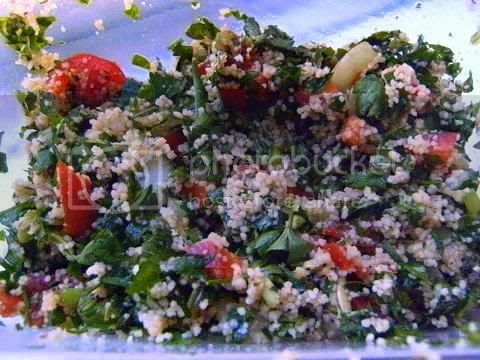 I made tabouli salad I used cous cous instead of the cracked wheat. When you cook the cous cous (or cracked wheat) place the stalks of the parsley and mint into the cooking water that way you'll get a better tasting salad. The cous cous is slightly pink I added sumac to the salad. 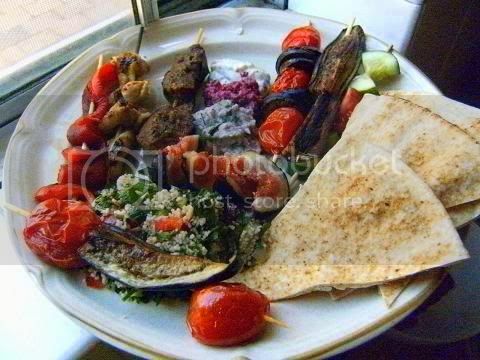 Final mezze platter I made some more pita using wholewheat flour I cut them with scissors to get very straight edges. 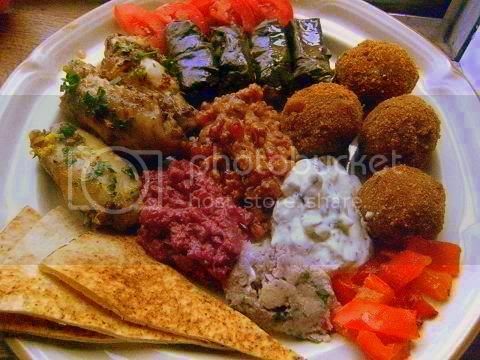 It is so nice to have fresh and cooked titbits on the same platter this is a very simple and quick mezze and great for a big lunch or a light dinner. Yum Yum is how to describe this feast. 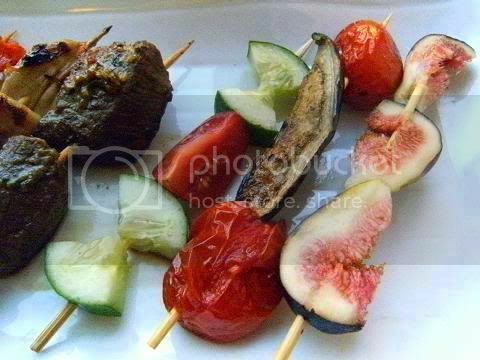 The fresh figs were especially nice with the other treats. 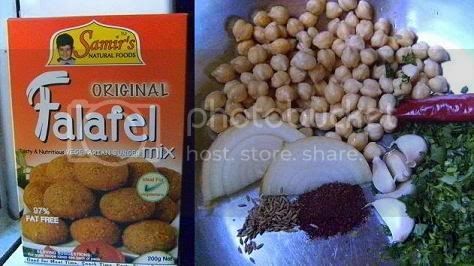 I thought it would good to do a comparison between the taste of boxed falafel mix ($2.70) versus falafel made from fresh ingredients (80cents). They made the same amount of patties. Box of falafel and the ingredients for fresh falafel. 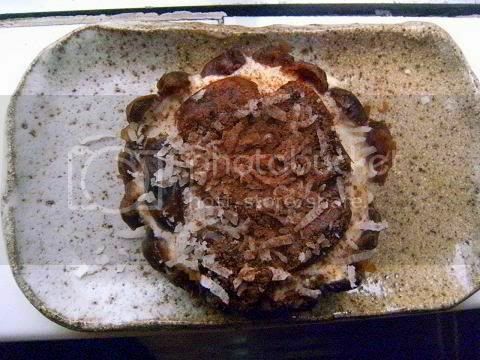 The box contained fava meal, bulgur meal, chickpea meal, selected herds and spices, sesame seeds, baking soda, salt and powered garlic. 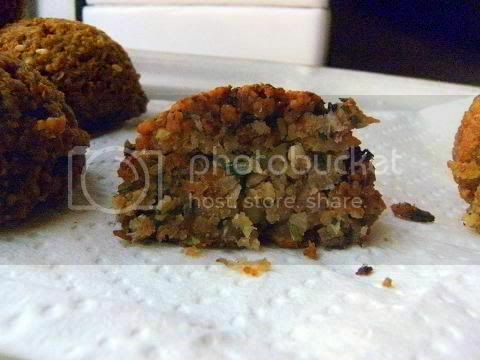 For the fresh falafel I used the optional recipe given in the challenge. 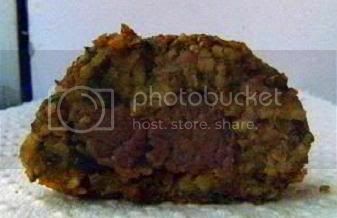 (Optional Recipe: Falafels - Recipe from Joan Nathan and Epicurious.com). The changes I did to the challenge recipe were to add 2 tablespoons of toasted sesame seeds and sumac and I used besan (chickpea) flour instead of the AP flour and I toasted the cumin before grinding it to a powder. 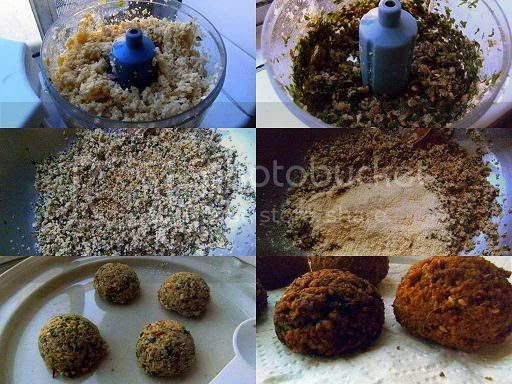 Process for making the fresh falafel – time taken to make the mixture about 15 mins. 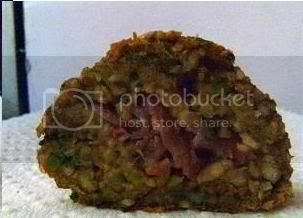 Simply process the uncooked chickpeas then process herbs and spices mix together then add flour/soda and form patties. The final mixture looks like it couldn't hold together but surprisely it does, so just follow the recipe I didn't have to add any extra flour or liquid. 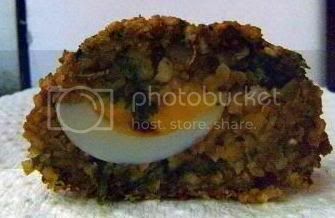 This is the crucial part of the recipe, you have to pick up some of the 'dough' and see if it will form into a ball and hold its form. If it's too wet, it will be squishy – add a little more flour. 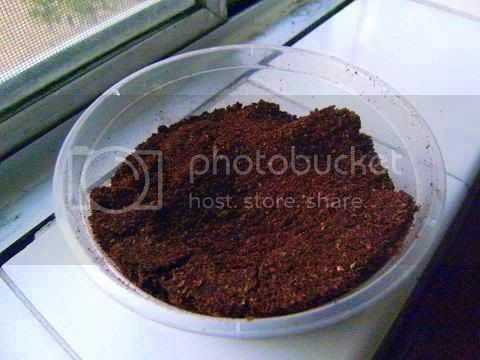 If it's too dry, it will crumble – add just a little water or lemon juice. I didn't find it necessary to refrigerate I used the patties immediately. The smell is amazing while you are making the mixture! I wish most recipes where so simple, easy and quick to make and the recipe works to a 'Tee' I should mention I used soaked chickpeas that were in the fridge (in a container with no water) overnight maybe this helped dry them so making the whole process so effortless. The many reviewers of this popular recipe suggested to fry the onions first just a few mins as the raw onion can be be too strong for some people but I didn't have any problems and I really don't like the taste of raw onions in foods. 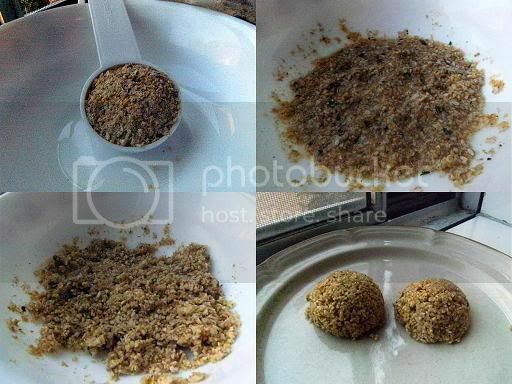 I made both kinds of patties (boxed and fresh) the same size I used a measuring spoon as the form for the patties, as can be seen the fresh falafels expanded a lot when deep-fried but the boxed mix didn't increase in size at all. There are only three words to describe this challenge falafel recipe - exquisite, delectable and scrumptious!!! The fresh falafels were much quicker and so much lighter, moister and tastier than the package mixture which was salty and heavy in texture in comparison. Falafels from shops can be very dry and too crunchy these were perfect. The fresh falafels were very tasty and reminded me of hot summer days on the farm! This is one time where the fresh recipe was much faster than the boxed version. 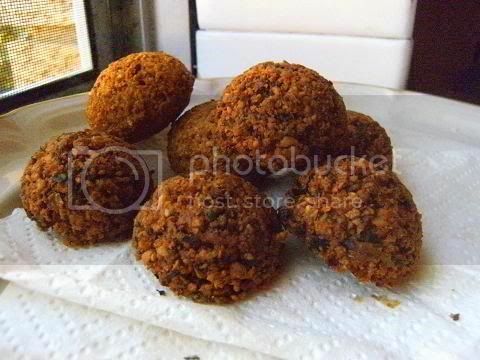 I decided to do some special falafels I used the falafel-mixture as a coating for some titbits then I deep-fried as usual. 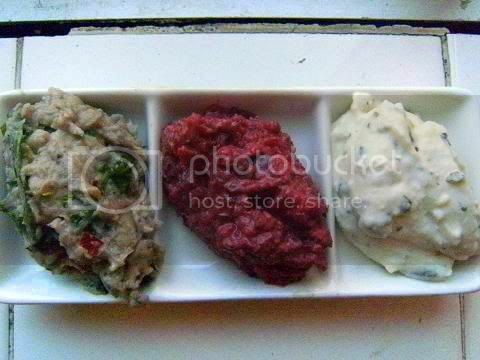 I had another mezze today (an early Australia Day BBQ), I made Muhammara which is so delicious and so simple -- walnut and pomegranate go so well together. 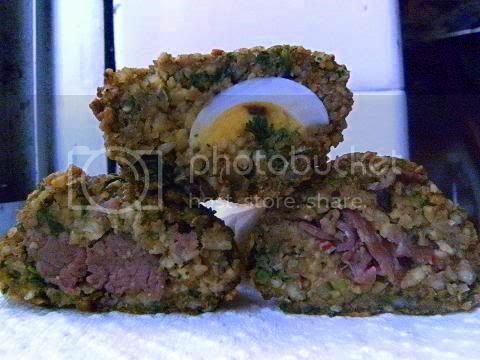 I made Scotched Quail Eggs using a lamb/mint/sumsac sausage coating this was excellent I'm doing these again tomorrow. I got some one-year-old preserved lemons (from my Lebanese neighbour!) 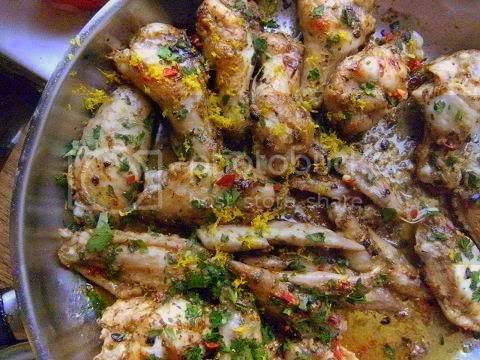 so I made preserved lemon citrus chicken wings, the preserved lemons sure have a very very distinctive flavour but are nice in small amounts in foods remember to finely chop them. When the recipe says one lemon they mean one very very small lemon use less than more. 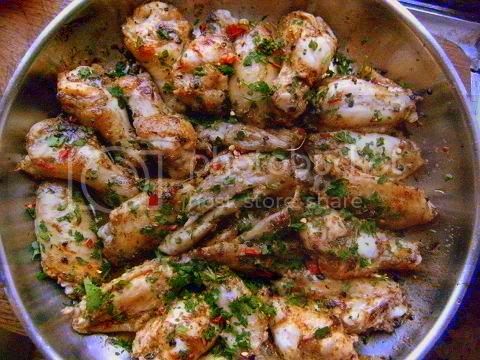 I made an overnight marinade of the sauce in the recipe and cooked them on the stove and the parsley gremolata was perfect with these chicken pieces. They were very Middle Eastern tasting so great and refreshing. The preserved lemons taste horrible so bitter and salty but really give foods an exquisite lemon flavour. 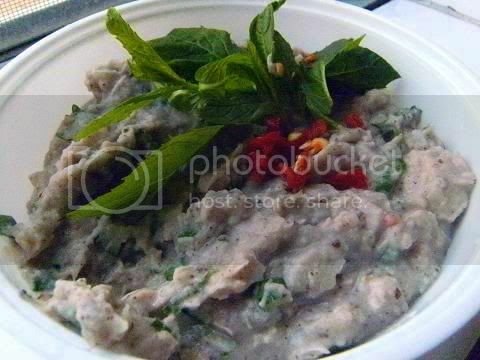 The Mahshi Warak Enab (Rice stuffed vine leaves) are simple but time consuming to make about 1.5 hrs all up and have a very strong pleasant taste, and are best the next day. I put them into a container and topped it up with olive oil so they will last for a week or so. Clock wise from top left hand corner - 1 year old preserved lemons, Muhammara Dip, Scotched Quail Eggs, Preserved Lemon Citrus Chicken Wings with Parsley Gremolata.